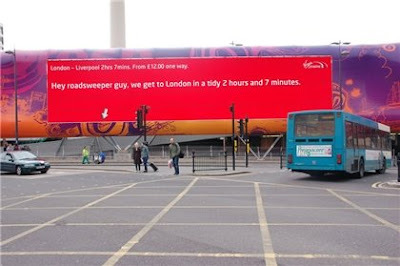 Virgin Trains have come up with an ingenious way to promote their new faster Liverpool to London route. 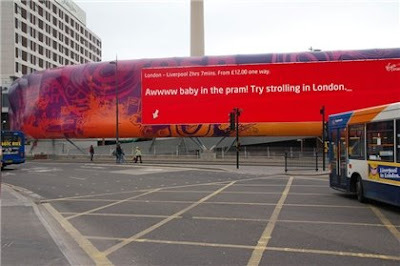 A 'talking' billboard.The screen displays personalised messages to passers-by all linked to the route. Messages such as 'We're faster than that number 45 bus' are written by creatives observing nearby people. I think it's a brilliant interactive idea that really reinforces Virgin's cutting-edge profile. I bet the creatives behind it were tempted to write a few of their own messages. I don't know if I could resist, could you?